Brian Shea was paddle boarding in Long Branch, New Jersey, Saturday when he had this insane close encounter with a humpback whale. 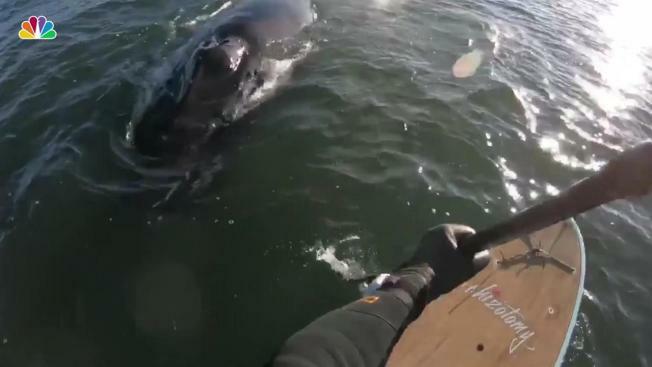 A New Jersey paddleboarder's incredible experience with a humpback whale over the weekend had him in awe, but his daughter says it was "too close." Brian Shea captured the stunning footage when he came up-close with a humpback whale. The Jersey Shore local took his board out at Long Branch beach Saturday in the hopes of seeing one of the spectacular mammals from the water. He said he'd recently seen two humpbacks feeding less than a mile from the beach and conditions were perfect for whale watching. "I usually bring the GoPro with me, because you never know what you're going to come across in the ocean," he said. But Shea had no idea just quite what he was going to come across this time. As he paddled out, the dark outline of a whale can be seen slipping through the water about 20 feet away from his board. Suddenly, the whale breaks the surface just a paddleboard-length away from Shea. The father of two said his daughter, who often goes out with him, watched the video and said it was "too close." "Generally I'm not scared of the dolphins or whales as they're not aggressive, but I also respect their space and appreciate that they are wild animals, so anything can happen," he said. "With regards to Saturday's really close encounter, I was more in awe than afraid as I've gotten used to being so close to them and view the entire experience as something I'm so fortunate to see in nature." Shea, who grew up swimming at New Jersey's Point Please Beach, said he has been out on the ocean for more than 40 years and considered this one of his most amazing experiences. The fact that New Jersey locals could see humpbacks in their natural environment just off the shore was something special. "Over the years we've gotten accustomed to seeing the dolphins on a nearly daily basis through the summer months," he said. "With that, I also appreciate that you could sit on the beach, every day for the next 20-years & never see a whale…so what we've been experiencing at the Jersey Shore these past few weeks is really magical." More videos of Shea's close encounters can be found on a Jersey Shore whale and dolphin watchers Facebook page.